This is the first book I have read by Michelle Zink. I have not yet had a chance to read her wildly popular Prophecy of the Sisters series. This book immediately starts with action. We find Helen in her bedroom when her mother comes in asking her to hide in a secret room behind her wall- a secret room that Helen didn't even know exsisted. After a tragic loss, Helen makes her way to two brothers who have been given the task of protecting Helen and instructing her on the Dictata. This book is full of fun steampunk elements that I did not expect. I loved reading a steampunk novel that was connected to angels. This book, however, is much more Infernal Devices than straight angel books that are out there. It is much lighter than other steampunk novels, and as the reader, I really appreciated that. I loved the innocence of the love between Helen and one of the brothers. There is whisperings of a love triangle in this book. Helen is reunited with a childhood friend who is not what he seems. I wasn't annoyed by this love triangle at all- especially since it really isn't a triangle. 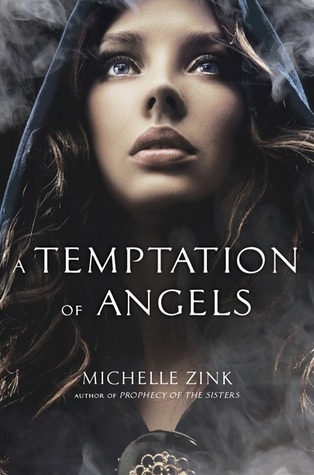 If you would like win a copy of A Temptation of Angels- head over this way. very cool. I am about to read the final book in the Prophecy series (I am a little behind), so I am glad to know that this series will be equally good. I will have to add this one to my TBR list. Thanks for the review! I am a lover of steampunk, so I think I will enjoy this! It's been on my TBR list for a while, but I have never got to buying it.